SHANGHAI - When news finally came that he had won his seven-year-old lawsuit, Chen Jiusong showed little sign of being thrilled. 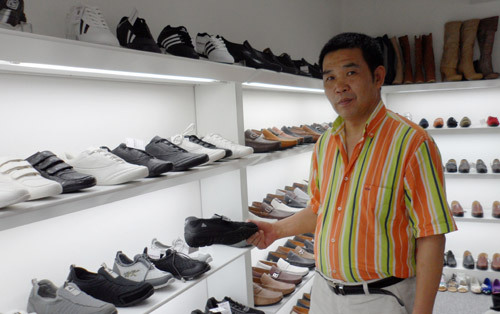 The 55-year-old shoe dealer from Qingtian, Zhejiang province, whose warehouse had been set on fire during an anti-Chinese protest in Spain, had still lost nearly everything he had fought for. "It's been a nightmare that I will never forget my whole life," said Chen, still full of emotion during a phone interview with China Daily. Years of hard work for Chen literally went up in smoke on a September evening in 2004 when a menacing crowd gathered in the warehouse area of Elche, Spain, where many Chinese shoe wholesalers like Chen are based. Banners reading "Chinese out" were held up and windows smashed by flying rocks. All the tenants closed their stores, hid their property and went home early to avoid any conflict - all except Chen, who happened to have a container of shoes being shipped from China that day. When the shipment carrying 12,000 pairs of shoes arrived, it and the stock in Chen's warehouse became the target of arsonists and were soon burned to ashes. He was held back by police and could only watch the flames. Earlier this month, a Spanish court announced that the 28 arsonists who set fire to Chen's goods would be sentenced to six to 18 months in prison. Chen will receive a compensation of 26,000 euros ($36,000) for his loss in the fire - a paltry sum compared to his uninsured losses of nearly 10 million yuan ($1,537,000). "For many, it's a matter of national pride or justice. But for me, it's all about survival. I have to make sure that my family won't suffer again from this kind of misfortune, and that's the only thing that has kept me striving for a verdict," said Chen, who went bankrupt after the incident. His wife abandoned him and their three children because of the huge debt. Chen was different from most of the rich Chinese businessmen from his hometown Qingtian or nearby city Wenzhou who went abroad to expand their business. He is the son of farmers who sold all of his property and left for Poland in 1990 to make his fortune. After working as a salesman for a Chinese shoe dealer for six years and accumulating about 1 million yuan, Chen quit his job and traveled to Elche - a city on Spain's southern coast that is the heart of its shoe industry - to start his own business. But for the locals, Chen was just one of the hundred shrewd Chinese dealers who flooded into their hometown with cut-price "made-in-China" products, causing many century-old factories to close and leaving thousands of them jobless. "The situation had been tense for a very long time, and was worsening with the arrival of more and more Chinese businessmen, who were lowering the price by squeezing their own profit to get a place in the market," recalled Chen. In fact, the case has caused many overseas Chinese to reflect on their way of doing business abroad. "We Chinese usually run a business with our family, especially when we are abroad. That means we rely on our relations for upper-stream supply and lower-stream sales - we take over the whole business chain, completely shutting our local competitors out," Chen said. "One lesson we learned from the incident is that we need to integrate ourselves into the local business circle more, allowing partnerships from our international counterparts and trying to achieve a win-win situation." But Chen has carried on, taking care of the business, the lawsuit and his children all by himself. "Life has to go on," Chen said. Although things have gradually gotten back on the track, Chen has yet to walk out of the shadow of the nightmare. "I don't have any plans for the future. It's a luxury for people like me. All I'm thinking about is how to fix things up as normal as before," said Chen. He hopes to come back to his hometown once he retires and lead an idyllic life in the countryside, as he did in childhood. "As the saying goes, 'east or west, home is the best.' As a Chinese, my home is always in China," he added.